This is my first digital camcorder. I really tried to do my homework before buying one. I had a list of “needs” and a list of “wants,” and then I had my budget, which was like a wrench thrown into the list! I searched online for loads of models, and visited my local BestBuy and Circuit City. I initially considered getting a miniDV camcorder (they use tiny cassettes to record the data), but I realized I’d also have to buy a supply of tapes (as well as carry them wherever I went), buy a firewire cable to transmit the data onto my computer, and buy software to enable the data to be read in my computer. What a hassle. I decided not to get a miniDV, even though these were within my budget. 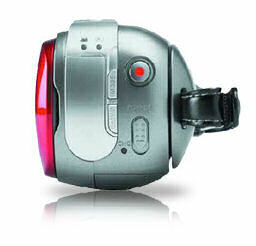 I really wanted a flash memory camcorder. I love being able to eject the SD card from my Canon digital camera and popping it into my laptop reader. It makes everything so easy and I’d like the same with a camcorder. But there is a caveat for the convenience: flash camcorders lose a bit of video quality compared to the miniDV. And flash camcorders are more expensive than miniDV. I have “lots of settings” for both because the effect of the settings is very difficult to determine. For example, there are several settings for light exposure (auto, daylight, cloudy, tungsten, etc). I don’t see much difference between them. All the color is washed out to a degree, no matter what setting I use. What good is having a variety of confusing settings when the difference between them all is negligible? To me, the flash memory capability and the outstanding battery life makes up for everything; I just wish it had more color. Here’s an example of a video on my digital camera, and another video with the Samsung. Guess which one is which? The first video is the Samsung. The video is clearer, but the color is not as vibrant as my Canon digital camera. That’s my only complaint with the Samsung. It is also very important to use a special “high speed” SD card for the Samsung. I used a regular, budget SD card and the video is somewhat blurry. When I switched to a Sandisk Ultra II SD card, my videos were much clearer. The reson for this is that regular SD cards write the data slower than the higher-speed SD cards. High speed SD cards are a little more expensive than the regular types, but not much more. It’s worth it, believe me. OK, enough about my impressions, now for the stats. The Samsung SC-MX10 is very lightweight, less than 1 pound. It fits perfectly into my hands (it’s about 3″ x 5″ and 2″ thick) and has a cozy adjustable strap. It is wonderfully portable. I can tuck the camcorder and my digital camera in the same camera bag. The Samsung comes with two batteries– a small button battery to save settings, and a lithium-ion battery. The li-on battery charges very quickly. The manual says the battery has 120-minute life, but I get up to 180. I am very pleased with the battery. The battery is charged while in the camcorder (cable included). There are ports for firewire/USB (which I don’t use since I simply eject the SD card), a multi-cable jack (AV/S), and the port for charging the battery. The buttons are very simple– power, record, play mode. These buttons are repeated on the LCD monitor when opened, so it’s very convenient. The camera powers up very quickly; it does not, however, have a “pause” feature. The optical zoom works very well, and retains focus. I found the button for zooming a little awkward. If you press the button too hard (easy to do), the zooming jerks in (or out). I wish I could set this to zoom slow (maybe I can but I am still trying to figure out all these settings). The camcorder also has a built-in microphone (which I found to be rather low) and a built-in speaker for replaying video. It has something called EIS, which is an electronic image stabilizer. If you have shaky hands, this is good– this feature helps keep the images a little steadier and eliminates the shaky effect. There’s a handy little button that, when pushed, will tell you in low-power mode how much battery time you have left. This is very convenient. When you power up the camera, the LCD monitor displays the battery time remaining and also– this is great– shows how many minutes you have left on your SD memory card! Love this! So my opinion of the Samsung? I love it, I just wish the thing expressed more color. It’s well-designed, very convenient, and I got a great deal for a flash camcorder. Knowing what I know now, I would never pay the retail price of $250-$280 for it, though. This camera is perfect for computer video, like uploading to video sharing sites (which is what I use it for). I don’t think it would be well-suited for larger TVs with home-video in mind. The poor color is a major detriment. ← NetFlix For Book Lovers? Chilly– is that why your name is Chilly? LOL. Hey, we need more Yankees. So many of them have gone south cuz the taxes are lower. Your wife sounds like a really great lady. She cooks great recipes AND plays Santa. Taxes are lower???? hmm, where????? LOL!!! This camera I have is a good one and I enjoy it a lot. But I knew very little about digital camera’s at the time and didn’t know better. And I would even be happy with another Kodak, but I just need more in a zoom lens. A nice little toy for the upcoming season. I wouldn´t mind finding one in my sock in Christmas morning, lol. As usual, you present us with good product reviews that point out pros but also cons. I know what you mean about the intensity of color being better with videos from your camera. 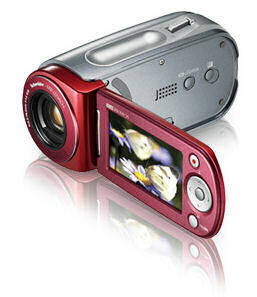 We purchased a new JVC Everio 30GB Hard Disk Drive Hybrid Camcorder last year. Our last JVC mini tape cam was just to difficult to work with when it came to transferring those tapes to the computer. We lost some of the clarity. When I was researching, a tech from JVC said that if I had more megapixels, I would have better photos/video. The Everio has 5 MP, but it still does not have that “burst” of color that I wanted. The tech had me talked into a High Def model that was considerably more expensive, but when I found that only people with High Def sets could view the video…we decided against it. The entire point of US buying a new cam was for us to produce highlight videos of DD2’s basketball and volleyball games to share with prospective college coaches. I still get better “short” MPEG videos from my Sony Camera, but I only have a 1G Memory Card. Not much video room on that…lol.